Freestyle motocross champion Jeremy Lusk died of head injuries Tuesday as a result of an earlier crash; he was 24. Lusk was riding in the X-Knights event in Costa Rica when he attempted to do a Seatgrab Indian Backflip and lost control of his bike. After the crash Jeremy Lusk was taken to Calderon Hospital ICU in San Jose, Costa Rica where he was pronounced dead at 11:03pm. In the room with Jeremy when he died were his parents Chuck and Linda Lusk, his wife Lauren, and fellow Metal Mulisha riders Brian Deegan, Cameron Steele, Erik Apple, and Ryan Hagy. Jorge Ramirez the Chief of the ICU at Calderon Hospital said Jeremy Lusk suffered from spine and brain damage. Jeremy Lusk had a successful 2008 and his future in motocross looked promising, until his tragic death. 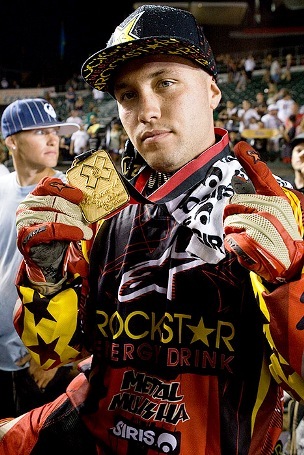 In 2008 Jeremy Lusk won the gold at the X Game FMX event, and the silver for best trick at Moto X. Jeremy Lusk was also named rider of the year by FMX, and appeared on the cover of TransWorld Motocross magazine in January 2009.
next post: 2009 Grammy’s Round Up – Better Late Than Never. He had the accident saturday and they put him into a drug induced coma to hopefully relieve the swelling of the brain which didnt happen. He died Tuesday am so the article was wrong. Yeah, so he was doing a hart attack…….and he didnt really “lose control” of his bike. Show some respect and get your facts together. its spelled HART tim. ur the @@@@en dumb@@@. Wow…. folks getting upset when a white trasher dies… whoop di do!! Stupid flatbiller! 53 queries in 0.630 seconds.